The village hall was packed to capacity on October 16th for the talk by Robert Hardy, the celebrated actor, with 140 of us listening enthralled to his memories of how he took on the part of Winston Churchill in a performance over eight hours of television in the series Churchill: The Wilderness Years, which earned him a Bafta for Best Actor. At first, Robert declined the part, thinking nobody could hope to recreate the Churchillian charisma, but he was finally persuaded and spent hours listening to the great man's voice until he eventually found the key - partly, a child-like intonation in some of his delivery. During his talk, Robert fell occasionally into Churchill's voice, in particular recounting one episode in which his beloved cat at Chartwell disappeared for a few days until Churchill one night had a note put next to lighted candle at a window with the words: "Come Home Mr Cat - All is Forgiven". He recalled one emotional moment during filming at Blenheim when one of Churchill's former secretaries visited the set and saw Robert from the back, sitting down and padded out. She was quite startled and told the crew it was as if the great man had come back. He also told about playing Churchill in french in Paris, quite aware that there was still a lot of Gallic hostility towards him over various episodes in the First World War. After witnessing the daubing of a statue of Churchill, Robert expressed his concern to the director, who said that there could, indeed, be the sound of seats being tipped up as some of the audience left - or maybe even some shots being fired. Fortunately, the performance passed off with the entire audience remain quiet and in place. More recently, Robert has appeared as Cornelius Fudge, Minister of Magic, in the Harry Potter films and he recalled filming in the Highlands of Scotland, alongside Michael Gambon and Robbie Coltrane. All three left their country house hotel in separate limousines (for insurance purposes) and arrived at the set to find the rain, inevitably, coming down in sheets. The Mexican director lamented that filming was not taking place in his warm and beautifully dry homeland and sent all three actors straight back to the hotel, where they spent a convivial afternoon with a bottle of Scotch. In addition, Robert talked about his other passion - the longbow - and gave us a snap-shot of its use in medieval warfare. He highlighted the immense strength required to pull one and yet bowmen could fire several steel-tipped missiles per minute, with each flying at tremendous speed towards vulnerable men and horses. He also gave an insight into his role during the raising of the Mary Rose, the Tudor warship, when Robert was a consultant to the project. During the exercise, over 6,000 steel-tipped arrows were discovered, as well as 138 longbows, which Robert kept at home under strict security and swore to secrecy any other experts who came to view them. His interest in the social and military of the longbow is as strong as ever and, indeed, Robert, was due to fly to the Bordeaux area the following day and was looking forward to investiagting some of the medieval battle sites in the area. Proceeds from the evening were £860, taking the total after eleven talks to £5,511. Robin Wheeler again filmed the evening and the footage will be edited in due course to form a YouTube which will be posted on the Wootton Talks website. (The YouTube of the Two Johns from QI giving their talk here has now had over 2,000 hits around the world). 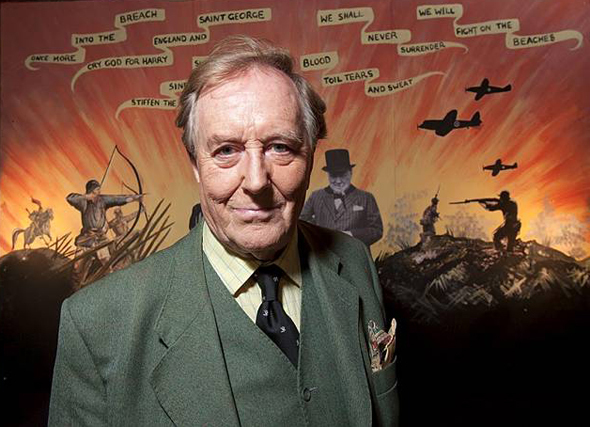 You can see why Robert Hardy has been - and still is - such a successful and popular actor. His talk was like a stage performance, fluid, funny and note-free. But what came across most for me was his professionalism and enthusiasm. A true star. - Chris Whelan, Wootton. I came along for my first Wootton Talk and thoroughly enjoyed an evening listening to Robert Hardy whose talk swooped between recollections of his early acting days, to the challenge of playing Winston Churchill, and then moved on to his great passion, the longbow, and its merits in warfare. Was I dreaming? Not a power-point in sight, just Robert chatting to a packed house. A big Thank You to the organisers and I will definitely come again - Helen Taylor, Middle Barton.